New Life in Ireland: I flushed Nemo! OMG do they still sell these things? 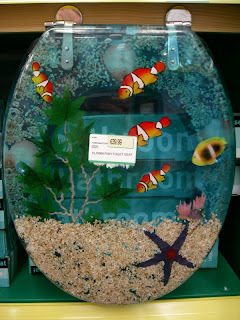 I remember going to the hardware store in 1976 and seeing these funny epoxy plastic toilet seats. I was fascinated by the one that had pennies, nickels and dimes stuck in it. I thought they were totally cool. Haha, I remember my mother giving a firm and resounding, "NO" when I asked enthusiastically, "Mom! Mom! Can we get one?" (By the way, Mom you were totally right.) Wow... I guess the 70's is still alive and kicking in some parts of the world. Oh wait, is that Carly Simon playing on the radio? "Clouds in my coffee, clouds in my coffee..." Well, I'm off to get a cup of Sanka and buy some flash cubes at the Woolworth store. Anybody see the keys to the Pinto? Oh my. Somethings are just NEVER going to be in style. You must just accept it.